When surfing the aisles of Target on Saturday I picked up one other product I wanted to share. 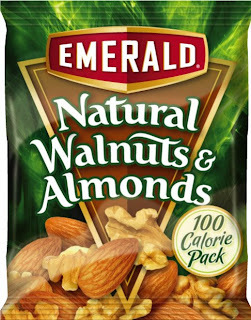 Emerald Natural Walnuts and Almonds in 100-calorie packs! I am a nut addict (I know you just giggled...). I can open a can of nuts and munch through four servings without noticing. And almonds and walnuts are two nuts that are very healthy for you but are also very caloric. So to find a preportioned package that contained both excited me to no end. I know I could save money by buying larger packages of both walnuts and almonds and portion them out myself. But I am amidst a couple crazy weeks at work and laugh at the idea of taking the extra 15 minutes to save a dollar or two. Scold me if you will, but my time is valuable, especially considering I won't have a non-work weekend for another month. Additionally, I can see the benefit of picking up a box on a work trip where I want to pack light but purchase healthy preportioned snacks at my destination. So, enough with the warrants for purchasing, let's get to the review! First, let me say I am saddened by the size of the package. I knew deep in my heart that I would not get a lot of nuts for 100 calories. Those fine folks at Emerald didn't find a way to flush calories and fat out of nuts, they only portioned them out for me. So I should have expected the 8 almonds and 2 tbsp or so of small walnut pieces. And I did.... sort of. But it helped smack my head into recognizing what a serving of nuts should look like. Oops. Second, let's examine flavor. I am picky about my nuts (teehee giggle like a school girl here). Especially raw unroasted unsalted nuts. They have to be full of flavor with no hint of rancidness or being picked before ripeness. These nuts passed the test (giggle again)! They are full of flavor and delicious! So much so that I wanted more. Luckily, I only brought one package into the classroom. And that's why I need preportioned packages... so I can ration my nuts (one more giggle). Final Rating: I would buy it again on a trip. Although it will take a long time to accept how small a serving of nuts is! I think it may be too pricey to justify buying at home again, although the pre-portioning was definitely an eye opener.